WE ARE DATA is a collaboration of unique professionals, dedicated partners and an advisory council. The project was realised with the support of a number of funds. All stakeholders are presented here. Autres Directions believes that collaboration between different disciplines is leading to cross-fertilization that adds value to the original ideas. The foundation focuses on projects at the interface between applied arts and journalism with a social commitment. They strive to reach a wide and diverse audience. VPRO Digital started in 1994 as the first Internet division of a public broadcaster in the Netherlands. VPRO Digital has always focused on innovative, content-related projects and within the VPRO is traditionally much attention to design. VPRO MediaLab has opened its doors in April 2015 on STRIJP-S in Eindhoven. This laboratory serves to gain faster insight into the latest ways in which media is created and consumed. VPRO Medialab has selected WE ARE DATA as one of the projects to start with and we work together to develop a medium to reach a larger audience with the theme data and privacy. Baltan Laboratories brings together people and organisations to initiate and promote free experimentation on the crossroads of disciplines such as art and technology. In collaboration with the Design Academy Eindhoven and HIVOS Baltan develops 'Age of Wonderland'. A program in which experts, students and activists engage with urgent social themes (theme 2016 Big Data). They also have a long-term programme ‘Hack the Body’ of which WE ARE DATA is part. This institute promotes the formation of political and public opinion on science and technology. To this end, they study the organisation and development of science systems, publish about social impact of new technologies, and organise debates on issues and dilemmas in science and technology. In the framework of WE ARE DATA Rathenau provides speakers for lectures and debates, starting during Europe By People. THE independent platform for and by the city of Amsterdam and her inhabitants. Also co-intendant of Europe By People, the official cultural program during the Dutch Presidency of the EU. 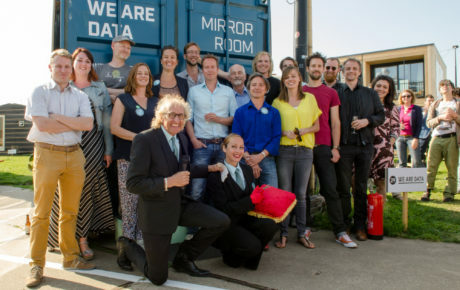 During this Presidency, we are developing the WE ARE DATA events in collaboration with De Zwijger. The MIRROR ROOM will also launched at their FabCity Campus in April 2016. Considerati is the leading legal consultancy firm that is completely specialized in legal advice and policy advice for IT and new media. Their key-specialisms are privacy, cyber security, copyright, ISP liability, e-commerce, innovation and the introduction of new technologies. They ensure that the WE ARE DATA MIRROR ROOM meets the required regulations of the Law on Personal Data. Acapela invent speech solutions to vocalize content with authentic and original voices that express meaning and intent. They developed 100 synthetic voices in 34 languages witch are ready to give a voice to any content producing a natural and pleasant audio result, by turning written input into speech. Bits of Freedom is the Dutch digital rights organization, focusing on privacy and communications freedom in the digital age. Bits of Freedom strives to influence legislation and self-regulation, on a national and a European level. Chair Informational Ergonomics, Deputy Head Department of Industrial Design, Head of Department of Human Information Communication Design and User Experience Program Coordinator. Chair Smart Environments, Data Protection and the Rule of Law and Research Professor Interfacing Law and Technology. Author of the book ‘Smart Technologies and the End(s) of Law’. Founder and former director of MOJO Concerts. MOJO organises two hundred concerts and festivals, which account for more than one million visitors.